This species is accepted, and its native range is Tanzania, Madagascar. Annual or short-lived perennial; culms 25–60 cm. long, slender, trailing. Leaf-blades lanceolate, 3–7 cm. long, 0.5–1 cm. wide, tapering at the base, thin, glabrous or pilose, finely acute. 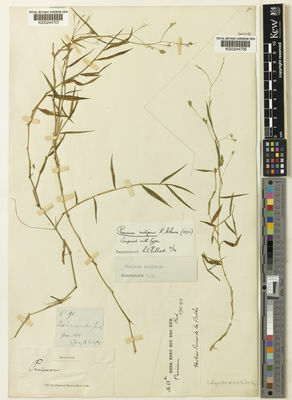 Panicle oblong, 10–20 cm. long, very sparsely dichotomously branched, the branches spreading and bearing tight clusters of 10–60 spikelets at their tips. Spikelets elliptic-oblong, 1.3 mm. long, glabrous, yellowish, acute; lower glume ovate, 1/3 the length of the spikelet, 0–1-nerved; upper glume 3-nerved; lower lemma 3–5-nerved, sterile, its palea poorly developed or absent; upper lemma pale, shining. Annual, or perennial; short-lived. Culms rambling; slender; 25-60 cm long. Ligule a ciliate membrane. 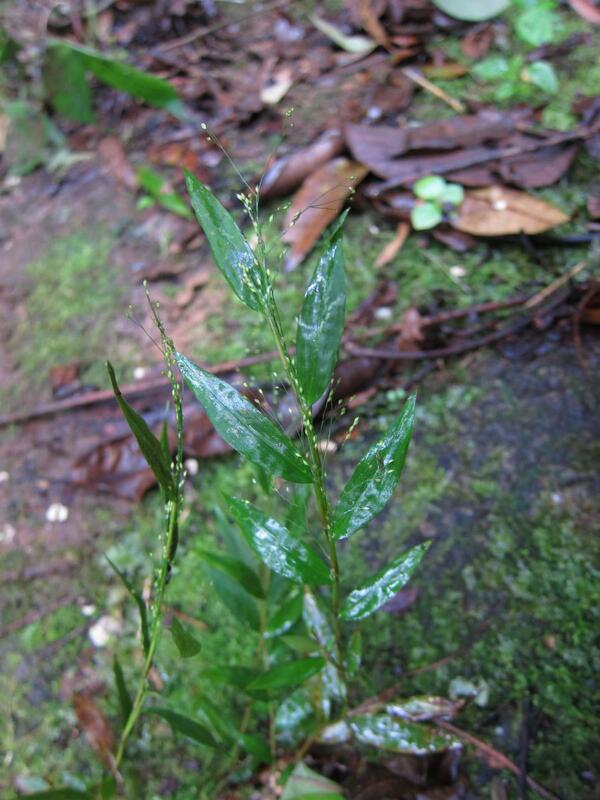 Leaf-blades lanceolate; tapering towards sheath; 3-7 cm long; 5-10 mm wide; membranous. Leaf-blade surface glabrous, or pilose. Leaf-blade apex acute. Inflorescence a panicle. Panicle open; oblong; 10-20 cm long; with spikelets clustered towards branch tips (in groups of 10-60 spikelets). Primary panicle branches spreading; sparsely divided; branching dichotomously. Spikelets solitary. Fertile spikelets pedicelled. Spikelets comprising 1 basal sterile florets; 1 fertile florets; without rhachilla extension. Spikelets oblanceolate, or elliptic; dorsally compressed; acute; 1.3 mm long; falling entire. Glumes dissimilar; reaching apex of florets; thinner than fertile lemma. Lower glume ovate; 0.33 length of spikelet; membranous; without keels; 0-1 -veined. Lower glume lateral veins absent. Lower glume apex acute. Upper glume ovate; 1 length of spikelet; membranous; yellow; without keels; 3 -veined. Upper glume apex acute. Basal sterile florets barren; without significant palea. Lemma of lower sterile floret similar to upper glume; ovate; 1 length of spikelet; membranous; 3-5 -veined; acute. Fertile lemma oblong; dorsally compressed; 1.5-2 mm long; indurate; pallid; shiny; without keel. Lemma margins involute. Lemma apex obtuse. Palea involute; indurate. Africa: east tropical and western Indian ocean. Perennial. Culms geniculately ascending. Culm-internodes 3-5 cm long. Lateral branches ample. Leaf-sheaths 3-4 cm long; striately veined; hirsute. Ligule a ciliolate membrane. Leaf-blades lanceolate; 7-8 cm long; 15-20 mm wide. Leaf-blade surface hirsute. Leaf-blade margins scaberulous. 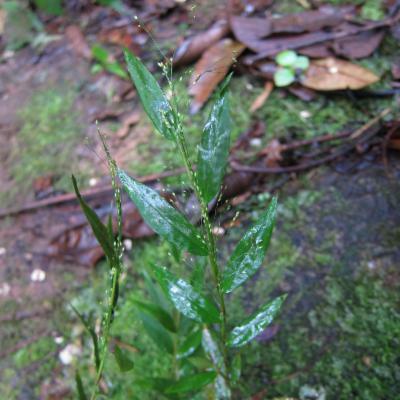 Leaf-blade apex acuminate. Inflorescence a panicle; terminal and axillary. Panicle open; lanceolate. Primary panicle branches 4-5 cm long. Spikelets solitary. Fertile spikelets pedicelled. Pedicels 1-2 mm long; ciliate; hairy at tip. Spikelets comprising 1 basal sterile florets; 1 fertile florets; without rhachilla extension. Spikelets lanceolate, or oblong; dorsally compressed; acute; 1.2-1.5 mm long; falling entire. Glumes dissimilar; reaching apex of florets; thinner than fertile lemma. Lower glume ovate; clasping; 0.4-0.5 mm long; 0.33 length of spikelet; membranous; without keels; 1 -veined. Lower glume lateral veins absent. Upper glume lanceolate; 1.2-1.5 mm long; 1 length of spikelet; membranous; without keels; 5 -veined. Upper glume surface pilose; hairy at apex. Upper glume apex acute. Basal sterile florets barren; without significant palea. Lemma of lower sterile floret similar to upper glume; lanceolate; 1.2-1.5 mm long; 1 length of spikelet; membranous; 5 -veined; pilose; hairy at apex; acute. Fertile lemma lanceolate; dorsally compressed; 1.2 mm long; indurate; pallid; shiny; without keel. Lemma margins involute. Lemma apex acute. Palea involute; indurate.